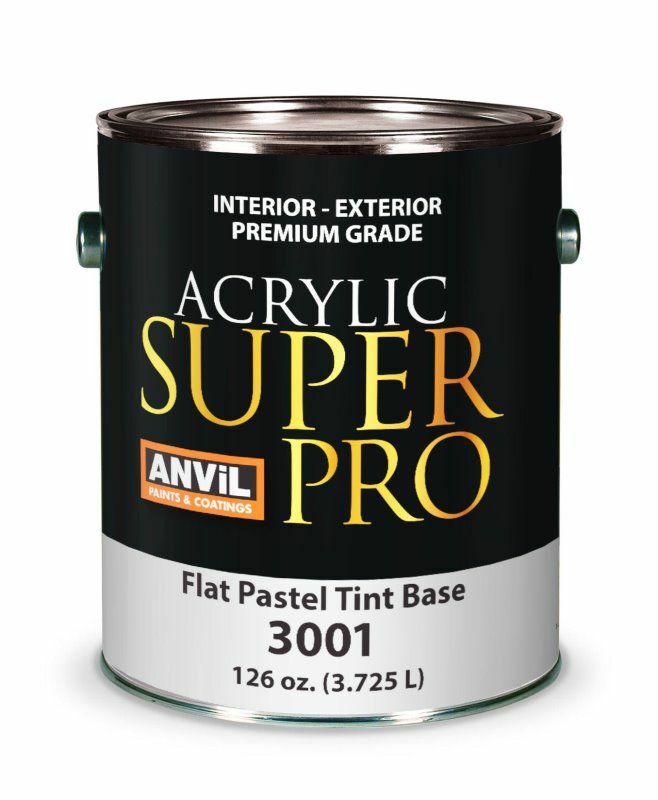 Anvil 3000 Acrylic Super Pro products are specially formulated with Premium Pure Acrylic Resins for durability and ease of application over a wide range of properly prepared substrates. Acrylic Super Pro is an excellent choice for residential re-paints, architectural and commercial applications demanding durability. It is low odor, water reducible and non-flammable. It provides a Flat finish with excellent high hiding properties, achieved buy brush, roller or airless spray application. Formulated for interior and exterior applications where the Professional Painting Contractor needs durability and ease of application with excellent wet and dry hiding power. Anvil Acrylic Super Pro products are specially formulated with Premium Pure Acrylic Resins for durability and ease of application over a wide range of properly prepared substrates. Acrylic Super Pro is an excellent choice for residential re-paints, architectural and commercial applications demanding durability. It is low odor, water reducible and non-flammable. It provides a Satin finish with excellent high hiding properties, achieved buy brush, roller or airless spray application. Formulated for interior and exterior applications where the Professional Painting Contractor needs durability and ease of application with excellent wet and dry hiding power. Anvil 5000 Acrylic Super Pro products are specially formulated with Premium Pure Acrylic Resins for durability and ease of application over a wide range of properly prepared substrates. Acrylic Super Pro is an excellent choice for residential re-paints, architectural and commercial applications demanding durability. It is low odor, water reducible and non-flammable. It provides a Satin finish with excellent high hiding properties, achieved buy brush, roller or airless spray application. Formulated for interior and exterior applications where the Professional Painting Contractor needs durability and ease of application with excellent wet and dry hiding power. 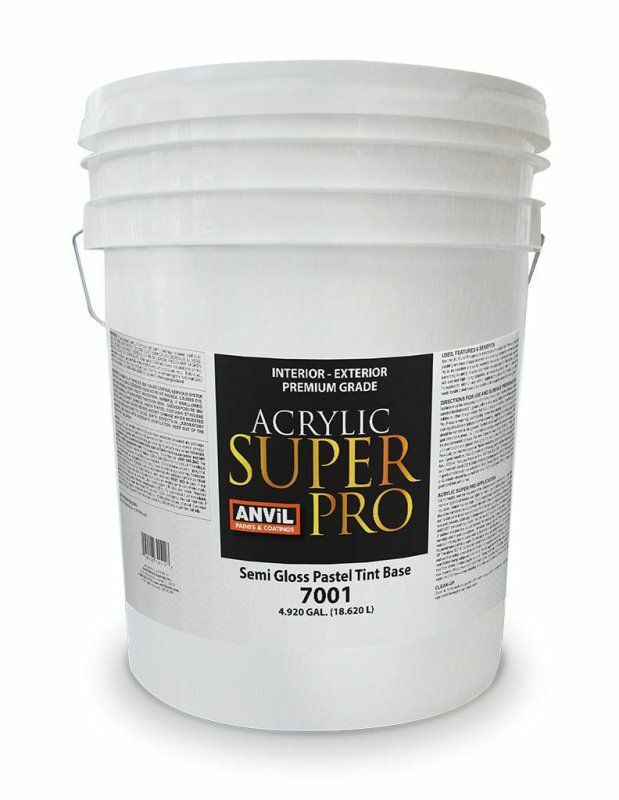 Anvil Acrylic Super Pro products are specially formulated with Premium Pure Acrylic Resins for durability and ease of application over a wide range of properly prepared substrates. Acrylic Super Pro is an excellent choice for residential re-paints, architectural and commercial applications demanding durability. It is low odor, water reducible and non-flammable. It provides a Semi-Gloss finish with excellent high hiding properties, achieved buy brush, roller or airless spray application. Formulated for interior and exterior applications where the Professional Painting Contractor needs durability and ease of application with excellent wet and dry hiding power. Anvil 7000 Acrylic Super Pro products are specially formulated with Premium Pure Acrylic Resins for durability and ease of application over a wide range of properly prepared substrates. Acrylic Super Pro is an excellent choice for residential re-paints, architectural and commercial applications demanding durability. It is low odor, water reducible and non-flammable. It provides a Semi-Gloss finish with excellent high hiding properties, achieved buy brush, roller or airless spray application. Formulated for interior and exterior applications where the Professional Painting Contractor needs durability and ease of application with excellent wet and dry hiding power.